Preserve the flavor of summer-picked apricots for use in recipes all year long by preserving your harvest of apricots. The preservation process extends the storage time for your apricots, though the texture of the fruit changes slightly during the process. Preservation only retains the flavor of the fruit, and it does not improve the flavor, and West Virginia University recommends only preserving apricots that you would consume fresh. Wash and dry the apricots. Peel, if desired. Cut the apricots in half and pull the pits out with your hand. Fill a one gallon bowl with two quarts of water and ½ teaspoon powdered ascorbic acid. Dip the apricot halves into the acidic water solution to prevent browning. 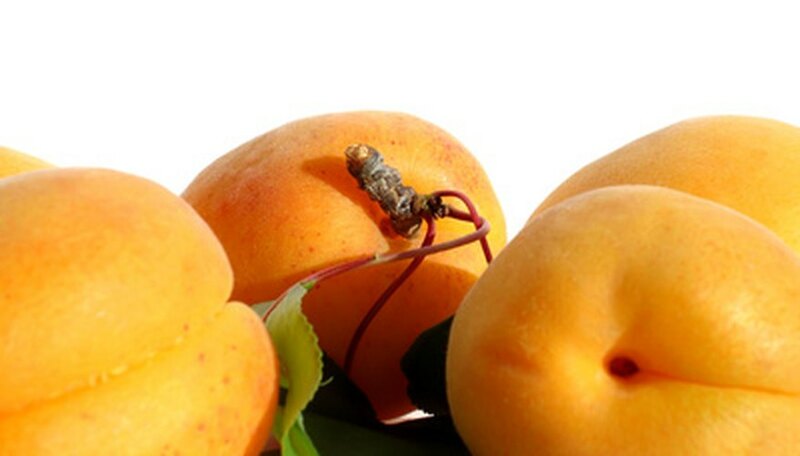 Fill one quart freezer containers or one quart canning jars with the apricot halves up to one inch below the top. Fill the containers with apple juice to cover the fruit, so the level of the juice and fruit stops one inch below the top. Seal freezer containers and freeze or process canning jars in a boiling water bath canner for 30 to 45 minutes based on your altitude, according to your canner's instructions. Wash and halve apricots, removing the pits with your hands. Fill a one gallon bowl with two quarts of water and ½ teaspoon powdered ascorbic acid, and dip the apricot halves into the acidic water solution to prevent browning. Lay the apricot halves in a single layer on a baking sheet, and preheat the oven to its lowest setting for 15 minutes. Set the baking sheet with the apricots into the preheated oven and leave the door propped open. Direct a small fan across the oven door opening. Leave the apricots to dry in this manner for 24 to 36 hours or until dry and leathery. Alternatively, arrange the apricot halves on food dehydrator trays in a single layer. Place the tray into a food dehydrator and dry, according to the manufacturer's instructions for 18 to 24 hours. Store the dried apricots in an airtight container for up to two years at 40 degrees Fahrenheit. Opt for a food dehydrator to dry your apricots if you have small children or pets that might try to climb into an oven with the door open for the oven-drying method. What to Do With Ripe Pears?